If you are “stung” by a lionfish: DONT PANIC! You are most likely not going to die, though you might wish you had depending upon how many spines penetrated the skin, the depth of the puncture, your own tolerance to pain and your body’s physical reaction to the venom. For most people the throbbing, intense pain is going to last for a few hours and will remain less painful for 12 hours or longer. One thing is for sure, everyone reacts differently and has a different experience. 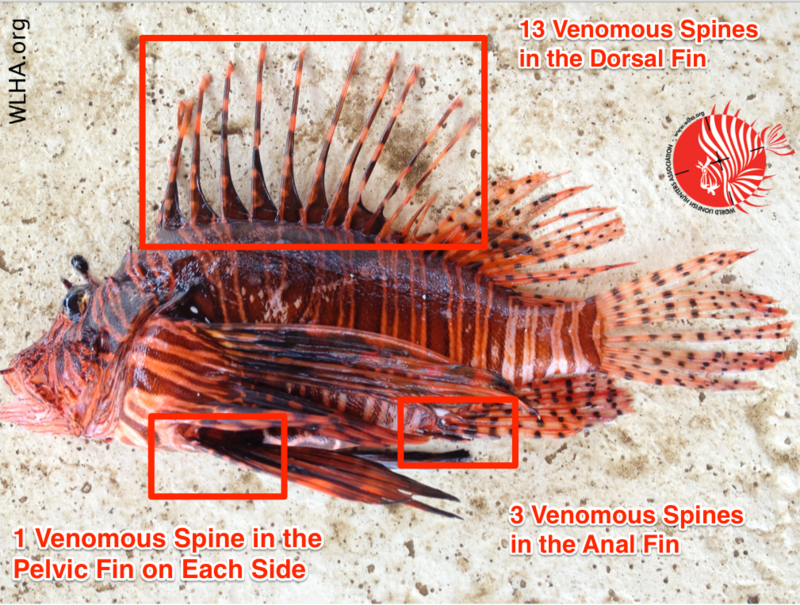 It is important to note that when we refer to “lionfish sting” we are actually talking about having one of the lionfish’s 18 venomous spines puncture the skin and causing a wound deep enough to allow the venom that coats the spines to enter the body and go to work. Minimize your chance of getting stung by wearing these puncture proof dive gloves and using a lionfish containment unit. Carry these reusable heat packs in your dive bag whenever you are lionfish hunting. If you still get stung, follow these instructions….. If you are diving you must get to the surface and onto land or a stable platform in a safe and controlled manner. Most divers (the author included) report that the pain does not come on immediately and the venom takes several minutes to begin to work. Let your dive buddy know that you have been stung and call the dive. 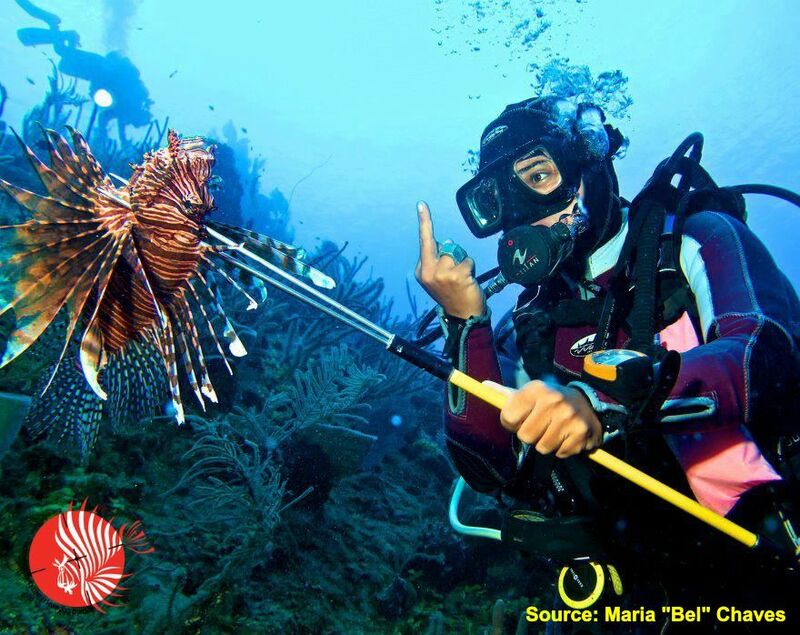 It is important to work out a signal for being stung to use underwater if you will be hunting or handling lionfish. We use a “finger gun” pointing to the wound area, then a thumbs up. Keep in mind that a diving related injury like decompression sickness or lung embolism is far more dangerous and likely to cause death than the sting. Inspect the wound closely for any signs that pieces of the spine might have broken off and are still in the skin. Gently remove them if you are able. Using clean, freshwater flush the injured area as completely as possible. 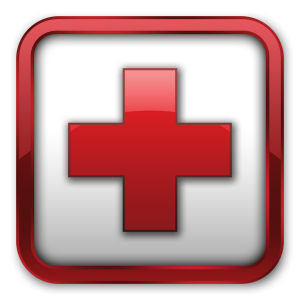 If you have a first aid kit available disinfect the wound with antiseptic towelettes and apply triple antibiotic ointment if possible. If necessary, apply direct pressue to the wound in order to stop the bleeding. Even though you will probably start to see swelling of the injured area, DO NOT APPLY ICE. The venom is protein-based and begins to breakdown with the application of HEAT. Heat will bring a noticeable relief to the pain and shorten the effectiveness of the venom. For this reason we always advise that a thermos of hot water be taken on any trip in which contact with lionfish is possible. Keep in mind that sources of hot water may also come from boat engine cooling water exhaust or water heated in a metal container on top of an engine block. Many resources will tell you that the water needs to be between 100°-115°F, but there really is no practical way to measure that or time to get water to the correct temperature in most instances. Immerse the wound in water that is as hot as the victim can stand without scalding or burning the skin. Soak for at least 30 minutes but as long as desired. If the affected area cannot be immersed then apply clean cloths soaked in hot water and change out or re-soak frequently to keep the heat up. If you do not have hot water available, then reusable heat packs like these are a great alternative; they are an important item to include in any marine first aid kit. If the victim can tolerate over the counter pain medications, now is a good to time take them. Diabetics and those with compromised immune systems may react very badly to the venom and it’s systemic effects. There is a very real possibility that people who are allergic to the venom may go into anaphylactic shock. Many people die every year from anaphylaxis. There may be pieces of spine left in the wound that you cannot see without an X-ray or other inspection. There has been at least one case of paralysis in both arms and legs of a home aquarist who was stuck in the finger. The paralysis went away completely in a short time, but it was a good thing he had sought medical treat when the symptoms of envenomation began to grow worse. Lionfish venom can cause tissue necrosis (tissue death) that has the ability to spread if not treated immediately when identified. You can also call the Poison Control Hotline at 1-800-222-1222. The Aquatic Toxins Department is available 24 hours a day. Everyone is welcome to call and multiple languages are supported however this is not a toll-free call from outside of the United States – 011-800-222-1222. We have a portable electronic heat and cold pack that heats to 112 Fahrenheit. We are interested in promoting into the diving industry and will be at the dema show this week. Will you be there? Yes, I will be at the show. I’ll come by and introduce myself. I got nailed badly today. Pain was so bad I didn’t know what to do with myself. We’re selling them commercially and getting lots at 16-17 inches. They are SCARY at that size. I soaked in very hot water for about 30 minutes. Then I soaked in ice water to handle the swelling. I also took 3 Aleves and was able to make 2 more dives as the venom deactivated after about an hour. Was stung yesterday at the lionfish roundup in Jupiter Beach for the Martin County Artificial Reef Fund. No one new what to do. This site was very helpful, because I’ve never felt such pain. Lasted 3-4 hrs….thankfully. A thermos on every hunting boat should be required!! I was stung 3 hours ago in Aruba hunting them with a local dive shop. Total rush but excruciating pain is just getting better now. My hand is fairly swollen and it just a light brush on one finger. I can’t imagine a real bad one with multiple hits. The reefs that are not dived regularly are covered with them. The only hope is that the Sharks start eating them soon. I was hit last week severely for the first time in Key West. I spearfish regularly and have been pricked many times though it only stings for 15-20 minutes. This time a wave caught the small dead lionfish on my spear and pushed it spine first down my spear and it harpooned me through my dive glove in 5 places. Worst encounter Ive had. Severe pain swelling and discoloration for at least 6 hours with radiating pain up the whole arm and into the neck and even chest. After 5 days I still have slight/minor symptoms of swelling and tenderness at puncture wound sites, but no sign of infection. The main intervention is soak in hot water, not scalding, as soon and as long as possible. I jumped off my surfboard in Barbados and landed on a lion fish on the reef. Very unlucky! !I had six deep puncture wounds each with a spine broke off in each. Morphine, local anaesthetic etc….I don’t know!!! I was in a dark horrid place for 4 hours. My arms and face went numb, my speech was slurred, I thought I was on my way out. I thought I was giving birth out my foot. Its over a week now and my foot is still hurting, swelling hasn’t completely gone and some of the puncture wounds have black marks on them. I think I was particularly unlucky as I stamped on the little satan of a fish. I wouldn’t wish the pain against my worst enemy! Actually I would. was stung 11 days ago, worst pain ever!!! but now the sting site itches SO badly, it wakes me up, have tried hydrocortizone, etc. anyone else experience this? how long will this phase last? swelling nearly gone. I hate the little mothers!! Worst sting ever! Just got stung off Barra Beach Moz, it’s been an hour now and there is no sign of pain going away, followed the instructions on this website it’s very helpful as no one has any clue about this sting. Worst sting ever! Just got stung off Barra Beach Moz, it’s been an hour now and there is no sign of pain going away, followed the instructions on this website it’s very helpful as no one has any clue about this lion fish sting. Well hello Scott. Just reading a little bit about Lionfish and saw your article here. Great info and wel written. Have a good one man! Higuys, its no laughing matter, i got hit down at a 106ft off the hilton in Barbados in the Lionfish-Derby sunday 13/11/16, the team killed in all 1003-lionfish, i got hit but the pain did not start till i reach the surface, they drove me to a clinic and got IV-drips of Tramadol and Morphine to kill the pain,did not work, then they said cannot give u any more drugs, you will have to bare the rest of the pain which was 7-hours, today is the 15th, and my hand still very swollen and heavy, the first hours you feel like having the hand chopped off. Just reading a little bit about Lionfish and saw your article here. Good!Great info and wel written. Have a good one man! I am a commercial diver. (over 30 years!) I was working off Indonesia on a pipeline once a number of years ago. I was moving along the pipeline in very poor visibility when I saw a number of Lionfish swimming in and out of my view. As careful as I was, I ended up getting stung down between three of my fingers on my right hand. I quickly removed my glove (made with kevlar!!) and saw 4 puncture wounds on my hand with blood streaming from the holes. I was struggling to recover myself to the diving bell as the hand was too painful to allow me to use it and pull myself back up. So with help from my bell partner, I managed to recover into the bell and back to the surface. We had an endless supply of hot water, so I immersed my hand in water that I could just tolerate. I took a couple of painkillers (anti-inflammatory) and continued to change the water periodically for approximately 2 hours. As mentioned, the pain is very intense and initially, the last thing you want to do is put the affected area into something hot!!! My hand was absolutely burning!! I was absolutely amazed that the pain just stops. One minute, excruciating pain, next minute, absolutely fine. Was stung 2 days ago in Choc Bay on St. Lucia. Dove for years in BVI & St. T., but water was churning up & I was standing about 20 ft front shore. Felt bites and lashes and couldn’t shake the fish. Everyone said jelly fish. I know what it’s like to be stung by schools of jelly fish & man 0 wars. I felt teeth. My leg has outline of the fish and huge bite marks from mouth. I used ice pack at first. Useless. Heat and Vinegar to help draw the venom. Luckily I had benedryl and morphine. It’s excrutiating. This short movie illustrates the mechanism. No more pain after injection of local anesthesia, then no venom or at least less after wash away by interstitial saline serum injection. It’s not very simple but may be helpful. Hi all, we are currently in the midst of our honeymoon in the Seychelles. I went snorkelling near some rocks yesterday on what was a wavy day, saw a few lionfish and stonefish but wasnt aware how seriously nasty they are before getting stung sadly. Suddenly I felt a sharp stabbing pain like I had my toe bitten off by a shark. I raced back to shore to assess what I thought was going to be a blood bath, only to find a puncture mark with just mild bleeding (like you would get from a toothpick/pin stab). The pain began almost immediately, I hobbled to the hotel reception and explained something stung me, they assumed it was a sea urchin, but at this point I was sweating heavily and in agony, in fact so painful I was shaking. My whole foot and ankle doubled in size within a few hours. I got a taxi to hospital where the doctor said venom/poison has entered via the puncture. The nurse loaded me with a jab of painkiller and an IV for something else, antibiotics and steroid pills. A few hours later the pain reduced from 10/10 to 5/10 thanks to the painkillers, then I went researching online to learn the ice pack the hotel gave me was not the right choice, I ran a bath of hot water and soaked foot for a few hours which took the pain down to 0-1/10. If it happened again I would happily soak my foot in boiling water if confronted with facing the venom from that fish. Awful experience, thanks all for the educating posts. I was stung by a lionfish in Barbados on September 11, 2017. I got immediate medical attention. Spent 3 1/2 hours at the doctor’s office with my hand soaked in hot water with vinegar. I got a steroid injection as well as an antihistamine. I was on steroids for 3 days as well as an antihistamine. My initial reaction included swelling of my finger which then traveled to my other fingers, my hand and wrist. Dizziness, on and off black outs, drop in blood pressure, nausea, etc. The swelling had subsided over the next 5 days or so and everything seemed to be healing fine. Some residual pain. Now the site (right hand, middle finger, I got 9 spine punctures, not too deep) is swelling again, HORRIBLY itchy. I am trying to not touch it. Only my finger is swelling, it has not traveled to my other fingers or hand, does not appear any different, just swollen again and still sore and stiff. Puncture sites are not oddly irritated or discolored. Wow, that sounds like a pretty bad sting. I’ve not heard of anyone having a ‘flare up’ later on, but there seems to be a wide variation in people’s reactions to stings. Hope you feel better soon! Got stung in finger yesterday while my hand was in the sand, I’m not sure if it even was a lion fish. I felt something soft in the sand &assume it was my partners feet & them BAm, I actually felt it pierce me really hard like it got hit with staples from a stapler machine. I only took an anti inflammatory & now my finger is swollen & pains alot. This happened at buccoo beach in Tobago. I was stung on the sole of my foot in 2003. i suffered about 2 hours as the pain would subside and then come full-force, and subside again. It felt like fire inside my foot. My brother-in-law brought me to a doctor. The old doctor sliced a lemon (as in a citrus fruit), rubbed the juices onto the affected area – and the pain was gone in about 10 seconds! the following day, i was playing tennis with my brother-in-law and i beat him. I stepped on one of these yesterday afternoon and while the intense pain did go away with the use of a hot watre soak, my toe is still blue and the top of my foot is pretty swollen. The puncture was deep in the side of my toe going down toward my foot.